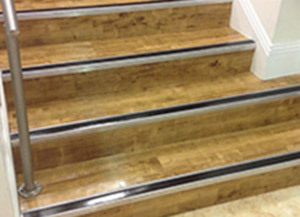 Floor.ie has over 27 years’ experience in Commercial Flooring and Specialize in Stair Nosing’s, we offer a professional supply and fitting service on all Stair Nosing’s (Stair Edgings). 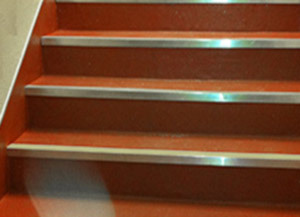 Stair Nosing’s are a very important part of health & safety in any building as Stair Edgings are used to highlight the edge of steps as per Building Regulations 2010 – BS8300:2009+A1:2010. 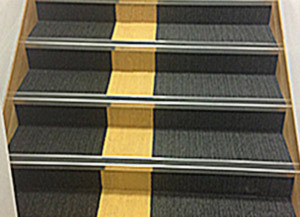 Anti-Slip Stair Nosing’s also provide protection against wear & tear of floorcoverings along the edge and will prolong the life span of your floorcoverings whether it be carpet or hard flooring, they are also used to prevent slip and trip hazards and are vital for visually impaired to provide a colour contrast between edge of steps and floorcovering. Stair Nosing’s come in a variety of styles and finishes with different colored inserts available and are available in Single, Double or Multiple channels in Square Nose, Raked Back, Bull Nose and Chevron in Aluminum or uPVC Profiles. As Health and Safety has become such a strong force over the last number of years Floor.ie have adapted to be in a strong place to recommend the right Stair Nosing for your needs. Floor.ie has over 27 years’ experience within the flooring trade and have been specializing in the Commercial Flooring sector for over 12 years. We have worked for some of the most prestigious companies in Ireland where we handle their flooring requirements from start to finish, whether it be Carpets Tiles, Safety Flooring, Luxury Vinyl Tiles, Marmoleum, Whiterock PVC Wall Cladding, Rubber Flooring and Stair Nosing’s etc. Projects completed: Scoil Aonghusa National School Tallaght 680m2 of Marmoleum – St Mary’s National School Tallaght 340m2 Marmoleum – Corpus Christy National School Homefarm 175m2 Marmoleum/Flotex/Tretford – DCU 1200 m2 – Oliver Plunkett National School 320 m2 Marmoleum – St Mary’s Girls National School 420 m2 Marmoleum – Community after School Project 380m2 Marmoleum – Bawnouge Community Centre 310 m2 Marmoleum. We also work with other brands Like Morley’s Stair Nosing’s & Feroda Stairs Nosing’s. Please feel free to contact Floor.ie for any flooring requirements you may have, we offer a full onsite survey, Totally Free of charge!!. floor.ie offer a free onsite survey!